Tonight, Tuesday 28 at 6 pm, Meta House hosts the opening of Anarchy is Dead!, an exhibition of paintings by Gregory Osborn, works arising from manic periods and the artist’s bipolarity. He posits the death of his anarchist beliefs, to be replaced by the new mystery school Entelarchy. 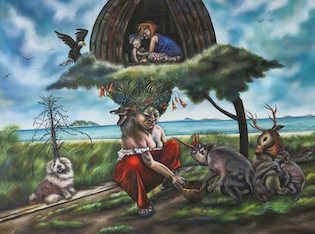 On Wednesday 29, Java Café opens Human Nature, paintings by Oeur Sokuntevy, exploring “the ambiguity between humanity and the natural world through fantastical scenarios.” Starts at 6.30 pm, runs until 7 June. On Thursday 30 from 6 pm, SaSaBassac opens their new exhibition Having a hole or empty space inside, a collection of drawings and sculptures by Yim Maline examining the ideas of progress in contemporary Cambodia. Runs until 6 June. Also opening on Thursday 30 at 6 pm is an exhibition at The Plantation: Water is Lifeby renowned Khmer photojournalist Remissa Mak. Through images of Cambodian rivers, lakes and canals, Remissa aims to highlight the importance of water for animals, vegetation, humans, and life on earth. The Phnom Penh Players’ production of Romeo y Juliet at The Mansion has it’s second and final weekend of performances on Friday 1 and Saturday 2. On Saturday 2, Amrita Performing Arts presents a showcase of contemporary dance at the Department of Performing Arts (see number 14 on this map), featuring new works in progress by Chumvan Sodhachivy, Yon Davy and Khon Chan Sithyka. 7 pm start, tickets $3. A little advance notification – next Tuesday 5 Java Café will host a conversation with the choreographers to discuss the showcased works. Phnom Penh Community College is holding a series of four workshops on evening photography in May and June. The course is targeted towards individuals with a DSLR camera who are interested in taking their photography to the next level. Ages 16+. Read all about it here. Tuesday 28 at 6 pm, Meta House hosts the opening of Anarchy is Dead!, an exhibition of paintings by Gregory Osborn, introducing the new mystery school Entelarchy. Thursday 30 at 6 pm, SaSaBassac opens their new exhibition Having a hole or empty space inside, a collection of drawings and sculptures by Yim Maline. Thursday 30 at 6 pm is an exhibition at The Plantation: Water is Life by renowned Khmer photojournalist Remissa Mak. Friday 1 and Saturday 2 at 7 pm, the Phnom Penh Players’ production of Romeo y Juliet at The Mansion. Saturday 2 at 7 pm, Amrita Performing Arts presents a showcase of contemporary dance at the Department of Performing Arts, featuring new works in progress by Chumvan Sodhachivy, Yon Davy and Khon Chan Sithyka. 7 pm start, tickets $3. Asia Foundation Community Art Gallery (#59, Street 242) presents Phnom Penh: Open City, Open Mind, featuring the work of Chhunly Poy and Kolab Koeurm (animation), Davit Pum (architecture), Chansi Voung (art and architecture), Prom Putvisal (painting and etching) and Kim Philley(fiction). Until June 11. MetaHouse marks the 40th anniversary of the fall of Phnom Penh with an exhibition of photographs taken by Roland Neveu on April 17, 1975. At Bophana Center, Transmissions 2015, looking at the 40th anniversary of the fall of Phnom Penh. Until the end of May.